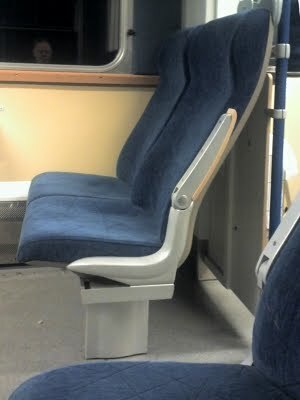 Despite decades of collecting ergonomic data, seat design on public transport is as erratic as ever. The most comfortable train seat I have ever sat in was in a second class compartment in a carriage built for the North London Railway in the mid-1860s. This was a bizarre shape - the back of the seat had a cross section like half a pear. Which meant that it provided good lumbar support. I have sat in uncomfortable seats in first class inter-city trains, and comfortable seats, like the one illustrated, on commuter trains. The key things to get right are lumbar support ie of the lower back, and the angle of the cushion, which should slope slightly from front to rear. If lumbar support is absent, a rolled-up sweater will provide it. Once these two things are correct, the spine will adopt the correct position. Seats in British Railways mark 1 stock were mostly on the sloppy side, exept for the last of the type, introduced in the 1970s. Much research went into the seats on mark 2 stock, and these felt odd at first but one noticed the benefit at the end of a long journey. Unfortunately, the designers went and spoilt the things with headrest wings which were hideously uncomfortable for people with long torsos. More recently, seats are something of a lottery. Southern's class 377 stock has excellent seats in some of the vehicles whilst others in the same 4-car unit are exactly wrong, with a horizontal cushion. Most train seats these days are curved in both directions, like car seats, to provide lateral support when cornering, but this makes them difficult to upholster. Trains do not go round corners so fast that lateral support is needed, and bench seats with a correct cross section are all that is required. The need to provide lumbar support coincides conveniently with the need to provide room for luggage between seat backs, as the curvature needed for the former creates space for the latter. An excellent example is the class 180 Adelante (below). The fashion for unidirectional (airline style) seating in trains ought to be questioned. 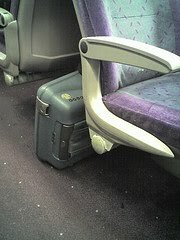 A few more seats can be fitted in, but at the cost of luggage space. A further drawback is that the upper edge of the seat back is unsupported, which means that the seats need a much heavier frame than if they were designed to be back-to-back or fixed to a bulkhead, and even then are liable to uncomfortable resonant vibration. With seventy or eighty seats in the average rail vehicle, this must add a substantial weight penalty. The subject needs to be looked into. Good observations, but seat design is not ergonomics. The seat supports the body under the buttocks, but the length has to be an optimized compromised for contact in long legs past the CG of the thigh and too much contact with the calf in short legs. The back, on the other hand, is far more complex with needs for support and space. The back needs support as you point out in the lumbar but only if there is space for the buttocks in the seat back to "scoot" back under the lumbar. The back also need support for the chest. Seat height is a compromise in static passenger travel between height for the short to long torsos and the head rest. Seats have long struggled under the view that they are part of the ergonomic approach to design, but they have not been designed for the occupant's body despite claims to the contrary. We developed software for seat design in automobile seats that takes the position of the driver to operate the car and designs a seat that supports the variation in sitting postures found in the global population. This is a major step in the direction of building a seat, in different vehicles for driver or passenger, that fits the global population. The human body shares a common functional anatomy that sits in the seat and needs understanding and use of landmarks that are common to everyone for an optimal design for the seated Homo sapiens. 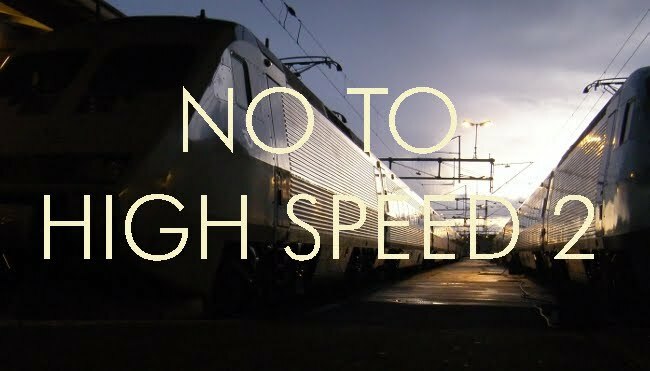 Good blog and hope that this is not too late for use in improving the argument that seats need better design in trains, planes and automobiles.